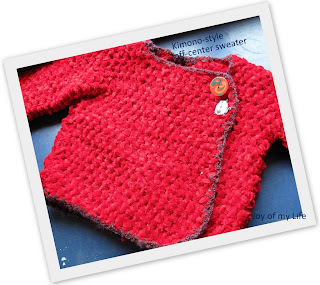 The pattern is inspired by Julie's baby sweater pattern which I have adapted for many different baby sweaters. I just made a few changes, adjusted the gauge, sized it large enough to go over Ana's clothes, and used chunky chenille yarn as it works up faster and is very warm. 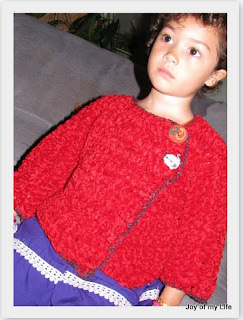 The little touches I liked adding were: made the sleeves flare a bit at the wrist as I think it is very cute and girlie; and made the neck a bit of a rounded-square (if it makes sense) to give it a classic look; added the edging in Ana's choice of purple bouclé yarn. Ana chose the buttons for this sweater - it was jarring my senses a bit, but she wanted the large red round paisley pattern button with the gray cat one, and I couldn't refuse. After all, she's going to wear it.